Israeli Prime Minister Benjamin Netanyahu arrived in Washington on Sunday fully expecting to get a political boost by basking in the limelight with a defiant President Donald Trump and making a major speech before 18,000 attendees at the annual conference of Israel’s powerful lobbying group, the American Israel Public Affairs Committee (AIPAC). 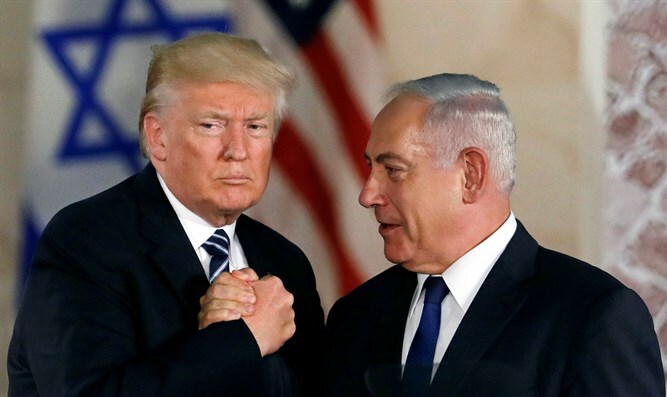 Netanyahu is facing a tough challenge in Israel’s April 9 elections, and it appears Trump is prepared to do everything to help Netanyahu win. Three days before Netanyahu arrived in the US, Trump announced his recognition of Israeli “sovereignty” over the occupied Golan Heights, which was captured by Israel in the 1967 war. Though a clear violation of international law, Trump’s gesture will have helped strengthen Netanyahu’s political image. Meeting with Trump also allowed Netanyahu to bask in Trump’s glory. Last week, Special Prosecutor Robert Mueller’s two-year-long probe ended with no evidence of Russian collusion with Trump’s campaign during the 2016 election. The Washington trip was also intended to allow Netanyahu to escape from under a cloud of alleged corruption. He is facing indictment over allegations that he illegally profited from the sale to Egypt of a submarine that was built by a company in which he held millions of dollars in investments. When Netanyahu set foot in Trump’s White House, he fully expected to return to Israel a stronger candidate, reversing polls that show his election vulnerability. However, an errant rocket fired from the Gaza Strip “accidentally,” according to Hamas leaders, struck an Israeli home 12 miles north of Tel Aviv, injuring seven Israelis and reminding Israeli voters that, during 14 years of leadership, Netanyahu has failed to achieve a resolution to the violence as well as the turmoil in Gaza. Netanyahu cut his US trip short and quickly returned to Israel as fears of escalating violence grew. Israel’s military began shelling Hamas targets and voters are wondering how far this confrontation will go. The largesse and election boost Trump and AIPAC would have given Netanyahu vanished. The violence in Gaza has become an albatross for Netanyahu that he can’t easily escape. Israelis are wondering if they need new leadership to end the uncertainty. The PM’s rivals are led by a coalition of former Israeli generals who have years of military experience, which feeds the public’s confidence. In this election cycle, the issue of the status of the Palestinians has not been a major part of the political debate. Over the years, Gaza has become a base of conflict, an insolvable dire situation that Israel has failed to resolve despite repeated and massive military invasions and air assaults. Gaza has been simmering for months and might have continued to do so during the election had it not been for the errant rocket, which reminded the Israelis of Palestinian resistance. Although Netanyahu currently opposes the “two-state solution,” he has failed to offer a better alternative than the uncertainty of the status quo. He has been unable to define a future other than one of continued occupation, settlement expansion and uncertainty. The uncertainty is one reason why Trump has not yet unveiled his own “deal of the century” peace plan for Israel and Palestine, fearing it might impact the election results. A recent poll by Haaretz suggested that the Israeli people are not monolithic in their optimism or pessimism about the future under any leader, and are divided over what to do. On the issue of what to do with the Palestinians, 30 percent said they just don’t know. Another 28 percent oppose annexation of the West Bank. Those who support full annexation are also divided, with 11 percent supporting giving Palestinians political rights and 16 percent saying they should receive no rights. Slightly more than 15 percent support a limited annexation of Area C.
Only 34 percent support the fast-disappearing two-state solution, while 19 percent said they support “one state.” Another 9 percent support “confederation,” 18 percent support other undefined options, and 20 percent said they don’t know. Yet, Gaza remains critical. The Oslo Accords signed in 1993 by Israeli Prime Minister Yitzhak Rabin and Palestine Liberation Organization Chairman Yasser Arafat forged an accepted notion of peace in which Palestinians could travel freely between Gaza and the West Bank as one governed entity. However, the reality is that, after Rabin’s assassination in November 1995, Israel increased the separation of the two land areas, dividing and weakening the Palestinians. In 2005, Israel withdrew from Gaza, not so much to allow it to become independent, but to take its soldiers out of an environment in which they were continuing to suffer casualties in clashes with Hamas. Israel surrounded Gaza with an airtight military blockade, restricting the supply of materials, food, water and electricity to put pressure on Gaza’s nearly 2 million oppressed residents. Netanyahu’s primary election rival is three-star general Benny Gantz. His “Blue and White” political alliance includes two other military chiefs, Gabi Ashkenazi and Moshe Ya’alon. Generals have always been held in high esteem by Israeli voters. Rabin defeated civilian politician Yitzhak Shamir in 1992 to become prime minister, while in 1999 Gen. Ehud Barak defeated Netanyahu. Gantz is hoping that, on April 9, he will be able to continue that pattern of Israeli generals defeating civilian rivals. The latest strike out of Gaza has inadvertently refocused public attention away from superficial political stunts in Washington and put it squarely back on to an issue that could help Netanyahu’s rivals.